Happy New Year! If you want to eat more healthfullly in 2017, this meal salad can help you keep your promise. There is so much to love about this colorful winter salad bursting with flavor: tons of fiber, great crunch and sustaining protein from the chicken and almonds. 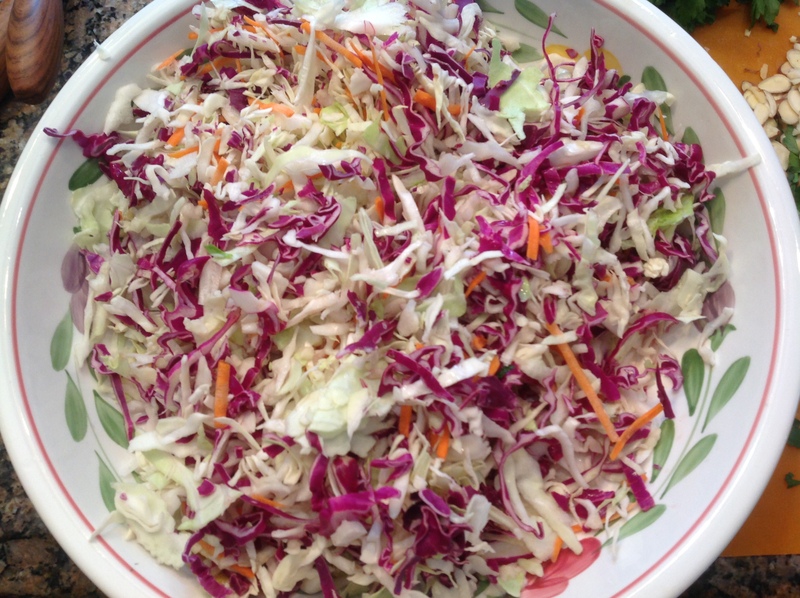 Tossing the shredded cabbage with some red wine vinegar while you chop the rest of the ingredients starts breaking down some of the fiber and adds a nice dose of resveratrol, to help fight cancer. 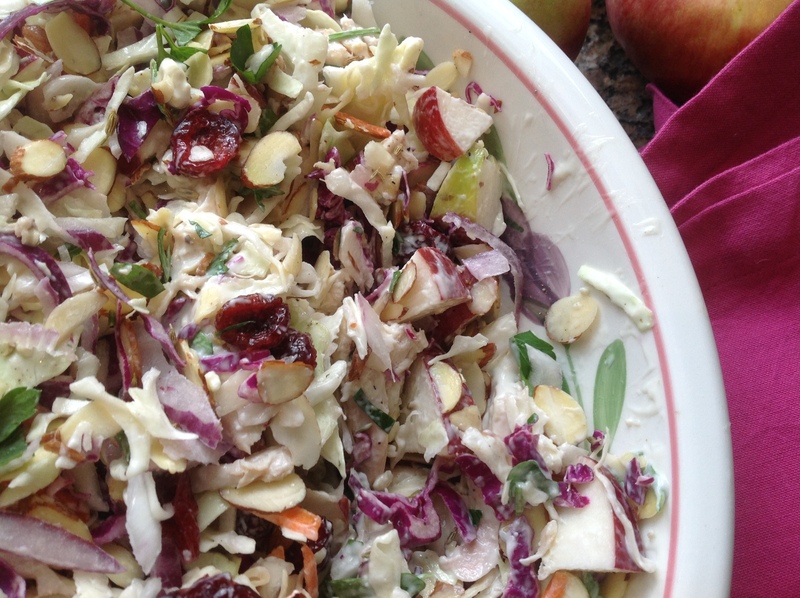 The cabbage, especially the red, is full of free radical fighting power and a good source of vitamins C, K, B6 and fiber. Using bottled blue cheese dressing and left over chicken makes it fast and easy to prepare, 20 minutes tops. Tossing the cabbage with the vinegar first also helps to reduce the amount of dressing in the salad and will keep the apple from turning brown. If you love the pungent taste of blue cheese, toss in an extra half cup of crumbles. Thinly sliced fennel bulb or julienned jicama would also be tasty additions. However you make it, this salad is wholesome and will give your winter diet a delicious nutritional boost. Dig in! In a large bowl, place the cabbage. Toss it with the apple cider vinegar to coat while you prepare the rest of the ingredients. 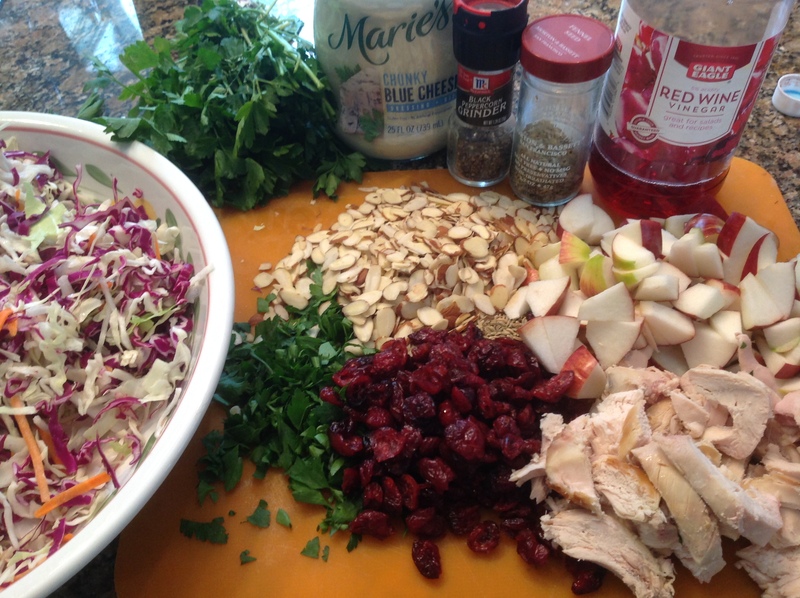 Top the salad with the chicken, the onion, the cranberries, the herbs, the fennel seeds and pepper. Toss the salad with the blue cheese dressing. Start with 1/2 cup and incrementallly add a bit more until the salad is coated to your preference. Top with the sliced almonds. Serves 4 as a meal or 6 as a side. 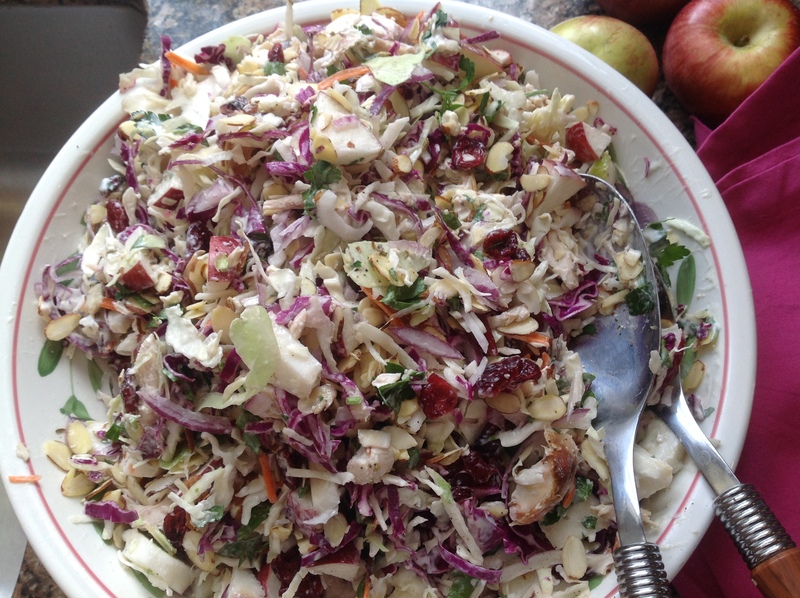 This entry was posted in Recipes and tagged apple cranberry chicken slaw, blue cheese, cole slaw, Cranberries, winter slaw by Johanne Lamarche. Bookmark the permalink. Johanne, I love the phrase when describing the health benefits of this salad “free radical fighting power” which is something we all need more of, in many ways, for 2017! I am trying to eat more healthy…lay off the vino…and get more exercise…so far, so good. I think your salad looks marvelous. I hope you are well, stay warm and Happy New Year. Happy New Year Teresa! Glad you are off to a healthy start . Looks like Nashville was spared some of the freak winter weather the south has endured. Looking forward to your continued inspiration in my inbox and instagram feed, broccoli girl! Thanks Jenna! 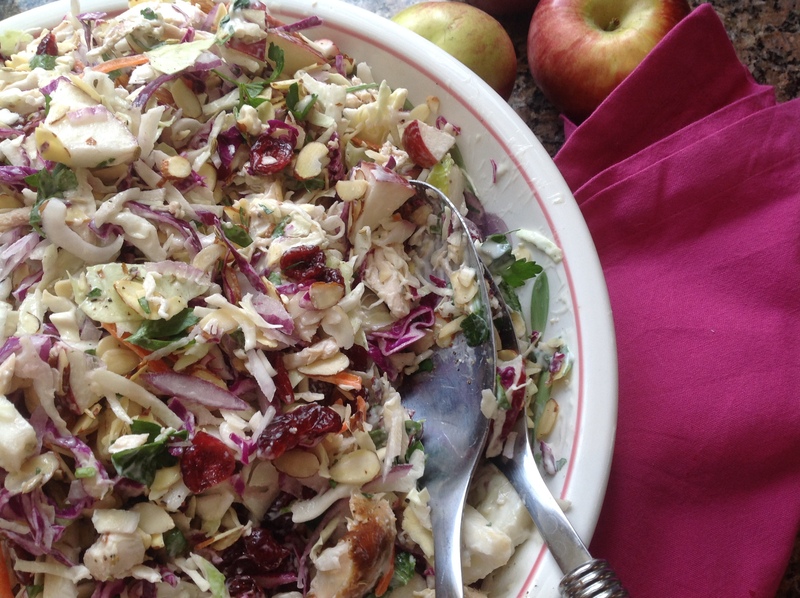 After your son in law’s cake, you will need this salad, maybe minus the blue cheese dressing! LOL! Some great inspiration there for a healthy and yummy winter salad Johanne. I think you just gave me an idea for my purple cabbage. I’m so ashamed of myself, I could not help reaching for the cookies and cakes over the holidays. I’m back with my exercise and healthy eating, but why do I always fall off the tracks? Here’s to a healthy 2017! 🙂 I hope you’re staying warm. You and me both Loretta! I made fewer cookies than in the past as we are still in construction and did not entertain this year but I ate more than my fair share! Salads for us both! This is one beautiful salad! I just love all of the color, flavors and textures. Perfect when nothing is growing! Thanks Julie! I always associate coleslaw with eating out or for special occasions. It didn’t feel like a “salad” to have it as a meal this way. Really good! How long will the cabbage stay good after the vinegar is on it? If I want to take it to lithe office for lunch, should I coat the cabbage with vinegar, put everything but the dressing in it then carry the dressing in a separate container? Hi Kelly! I think that would work well. We had it for leftovers over 2 days with the cabbage coated in vinegar, without the dressing, and it held up fine. Tossing the cabbage in the vinegar in the morning on the lunch day, assembling the salad, then waiting to dress it with dressing right before serving it will be perfect. Enjoy! !